A personalised hand painted wooden clothes peg board for a boy. A wonderfully useful and jolly board to help little boys decide what to wear today. A perfect, personalised, gift for any young boy. This string of hand painted wooden pegs has cut-out shapes of trains on the sturdy wooden clothes pegs. Crafted by our wild Welsh artists at Angelic Hen's beautiful studio in the Wye Valley, just add the name of your choice and they will do the rest. This inventive peg board gives little boys a helping hand with getting dressed in the morning. The hand painted personalised wooden peg board is made of wooden pegs and wooden cut-out shapes on a wooden board. 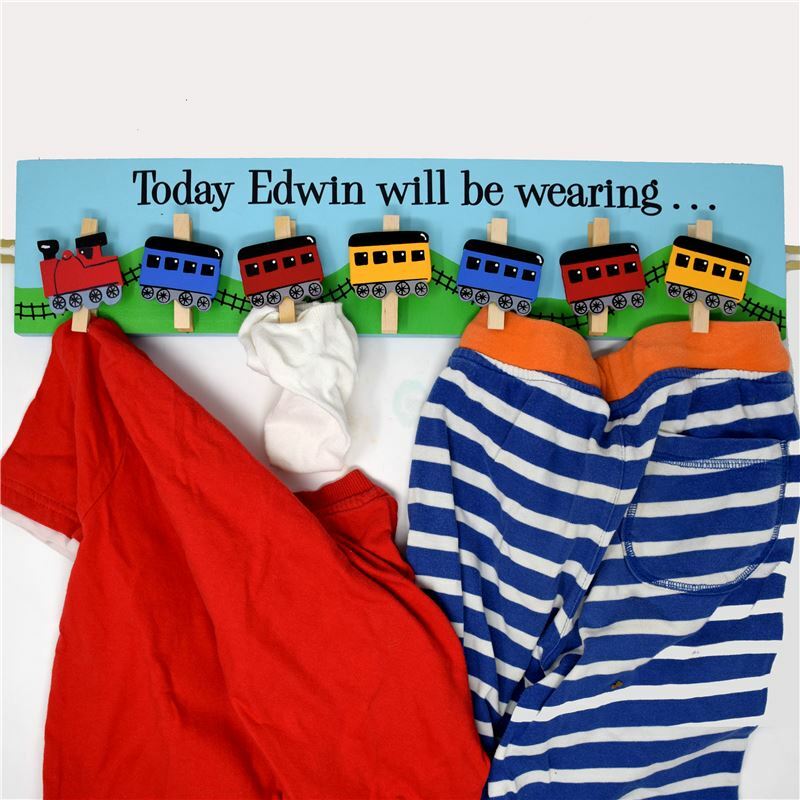 The wooden board is 50cm W x 11.5cm H x 1cm D, with pegs height 7.5cm holding cut-outs of trains approx 4.5cm H x 5.5cm W.
As this personalised wooden clothes peg board is hand painted to order please allow 2 weeks for delivery.